Although relatively unknown in North America, Scapin has been making bicycles since 1957. Quality has always been the goal of Scapin production and is one of the last companies in Italy to produce a frame totally in-house, including paint. 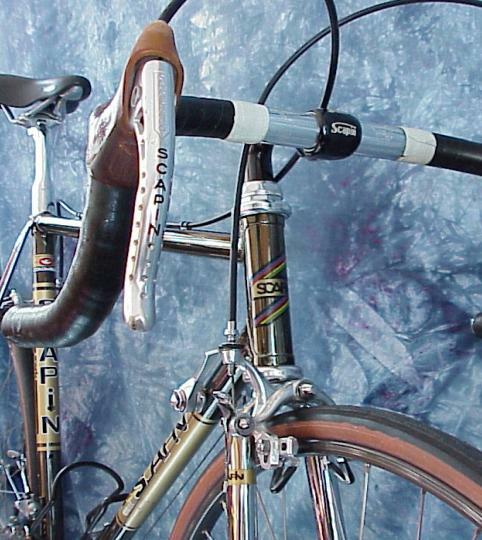 The Scapin pictured here is from the mid '80s. It's frame is built from Columbus SL tubing and the entire bike is chromed and painted using a transparent lacquer. This type of finish is commonly known as chromovelato. It is simply a beautiful bike, in all respects, and weighs in at a respectable 21.8 lbs with pedals. 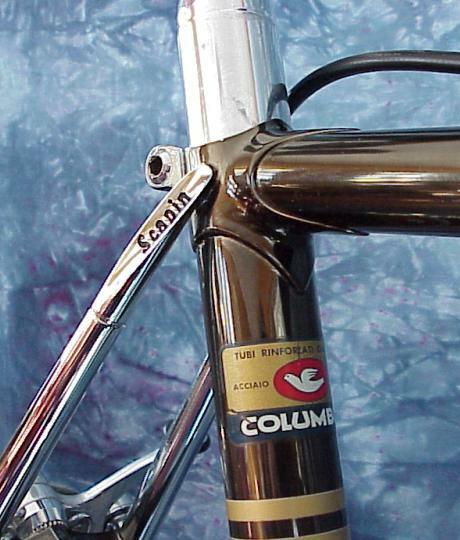 Columbus SL tubing was the flagship of the Campagnolo line during the '70s and part of the '80s. It is a chrome-molybdenum double-butted steel with the following dimensions: Top tube 25mm in diameter and the down tube is 28mm in diameter. The wall thickness at the ends of the tube are 0.9mm thick and drawn down to 0.6mm at the center of the tube. The internal diameter of the tube varies so that the tube is thicker at the joints (double-butted), where the stress is greatest. Columbus SL has an ultimate tensile strength (UTS) of 121,000 psi. Most of us cannot tell the difference between Campagnolo Nuovo Record (NR) and Super Record (SR) groups. The reason is that SR was, for the most part, an NR group with a few changes. Some of the differences between the two groups as follows: a) Black anodized parts on the SR front derailleur. b) Holes in the brake levers. 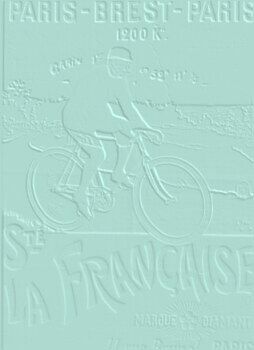 c) Fluted seat post. d) Black anodized aluminum pedal cages which for a period of time were available with titanium spindles that were prone to breakage. e) Aluminum headset. The Scapin pictured here contains a mix of SR and C-Record (c stands for corsa) components. 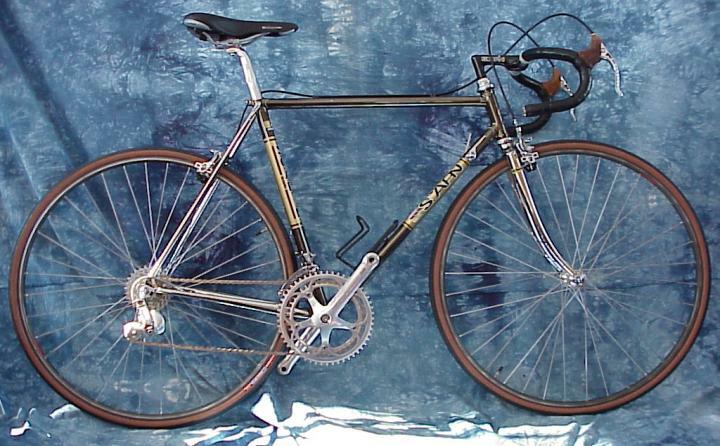 C-Record was introduced in 1986 and SR was discontinued in 1987 making this bike a mid '80s vintage. Campagnolo Super Record calipers and Scapin pantographed Super Record levers. Campagnolo C-Record (rear) and Super Record (front). 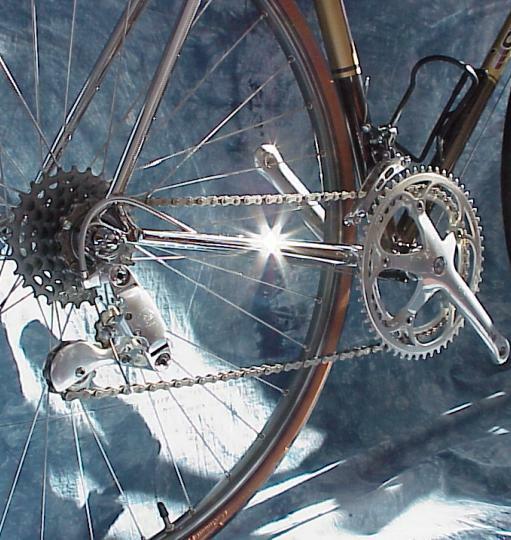 Campagnolo Record Superleggero (not with titanium spindles). Mavic G40 rims and Campagnolo Super Record hubs. Schwinn Vittoria Corsa CX tubulars. Salsa titanium skewers. Lugged Columbus SL frame with cast Cinelli bottom bracket. Scapin stamped dropouts. Seat tube (53.0 cm c-to-c). 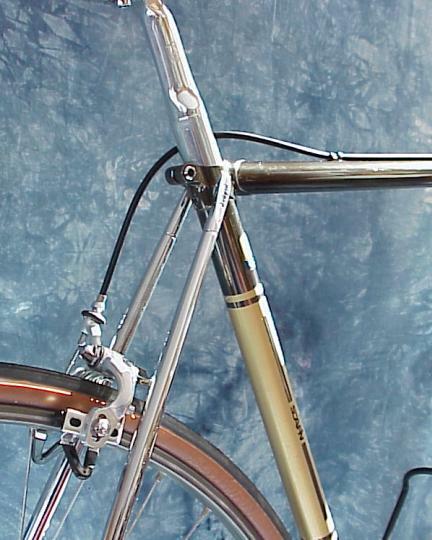 Top tube (54.0 cm c-to-c). Scapin chromed fork made out of Columbus blades.